Porchetta is made using the whole pig—deboned, stuffed and rolled, and Ariccia is the village that makes the very best one that serves enough for a large party. If you ever visited Italy, chances are that you have also walked though an Italian street food market, then you probably have seen little booths selling porchetta and porchetta panini. Nonna makes a small version of the porchetta during the Thanksgiving holiday, which in Italy is called “Festa del Ringraziamento” just like in America means Thanksgiving, but the tradition refers to the gifts that Mother Earth gives to us. 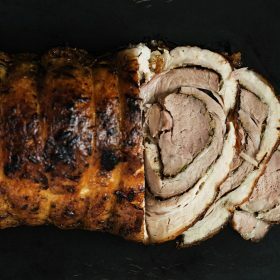 This year, I wanted to do something different for Thanksgiving, so I decided to save a turkey and make this recipe for pork lovers. The secret and distinct flavor is fennel pollen, that is imported from Italy, you can find at a gourmet food store or online, it is a bit expensive, but worth it! Just like the American Thanksgiving, there will be leftovers, and this recipe makes a delicious porchetta sandwich. If you have been to Italy at least once, you probably know what I am talking about. Porchetta is the famous classic pork roast that is found in every Italian square during market hours. Lay the pork skin side down on a work surface, with a sharp knife make a few slits in the flesh. Make a lengthwise slit on the tenderloin. In a small bowl, mix together the sage, rosemary, garlic, 2 tablespoons of salt and 2 tablespoons of olive oil. Spread the mixture over the exposed surface of the belly, working it into the cuts in the flesh. Spread some of the of the mixture in the slit of the tenderloin. Generously sprinkle the fennel pollen over the belly and tenderloin. Position the tenderloin in the middle of the pork belly. Roll up the pork belly around the tenderloin and tie with butcher’s twine. Place in a roasting pan. Make some slits in the skin with a sharp knife, drizzle with olive oil and season with salt and freshly ground black pepper. Place the pan in the oven and cook for 2 1/2 – 3 hours. The juices should run clear when pierced with a knife. Remove from oven and allow to rest for 15 minutes, loosely tented with foil. Slice and serve. You can eat the porchetta with an outstanding Italian panino made with ciabatta bread or simply enjoy it alone by eating it slice by slice.